1 10 oz. can Ro-Tel diced tomatoes and green chilies (*original) *Very spicy! 1. Chop the onions and peppers. Saute them in a little olive oil. Add the garlic once they have started to soften. Season with salt and pepper. 2. Add the hamburger meat and cook until brown. Drain off most of the fat. 3. Add the cans of tomatoes, the Ro-Tel, kidney beans, and tomato paste. Add the chili powder. Stir well and let simmer for at least a half hour. 4. Add the kielbasa and continue to simmer for another half hour or until the mixture thickens. Check for seasoning. You’ll probably need to add some salt. The Ro-tel will make the chili mildly spicy. If you like your chili really spicy, you could always add a second can of Ro-tel, or some hot sauce. 5. Adding a splash of vinegar brightens the flavor. Really the best thing you can do is to make this a day before you want to serve it. Reheating it and keeping it warm in a crockpot is the simplest approach if you’re serving a number of people buffet style. Adding bowls of shredded cheese, chopped sweet onions, sour cream, and salsa makes the chili even better. The option of adding a spicy salsa can elevate a mildly spicy chili to a hotter one for the people who like it that way. No, I haven’t stopped spiralizing. 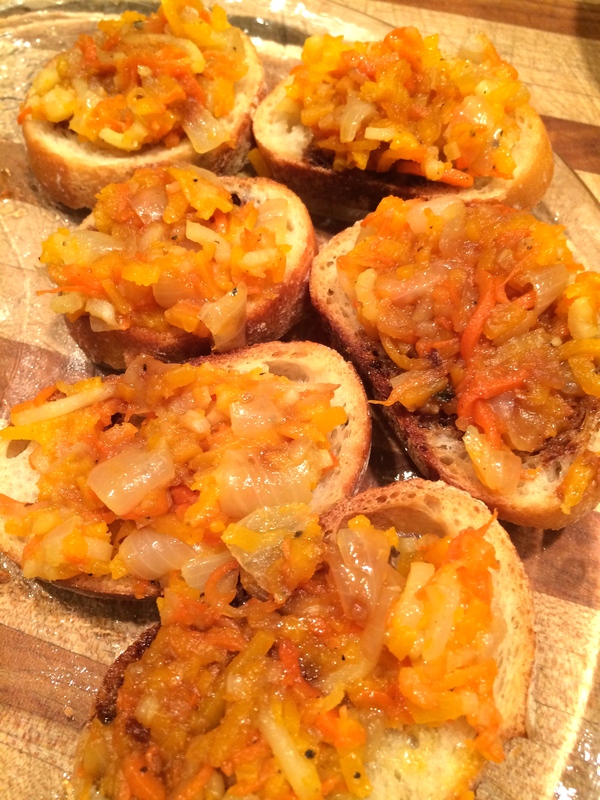 We had some friends over to watch the Patriots/Ravens playoff game yesterday, and one of the appetizers was sautéed spiralized root veggie bruschettas topped with a bit of aged balsamic. I thought that balancing the meat centered chili with at least one veggie appetizer couldn’t be a bad thing. It was a definite hit. Simply spiralize a few root vegetables including an onion. Saute them in a little olive oil until they are very soft. The consistency of caramelized onions. Season with salt, pepper, and a shake of red pepper flakes. In the meantime, cut a baguette into thin slices. Brush with olive oil and toast in a 425 oven until crisp. Pile the veggies onto the baguette slices and drizzle with a bit of balsamic. 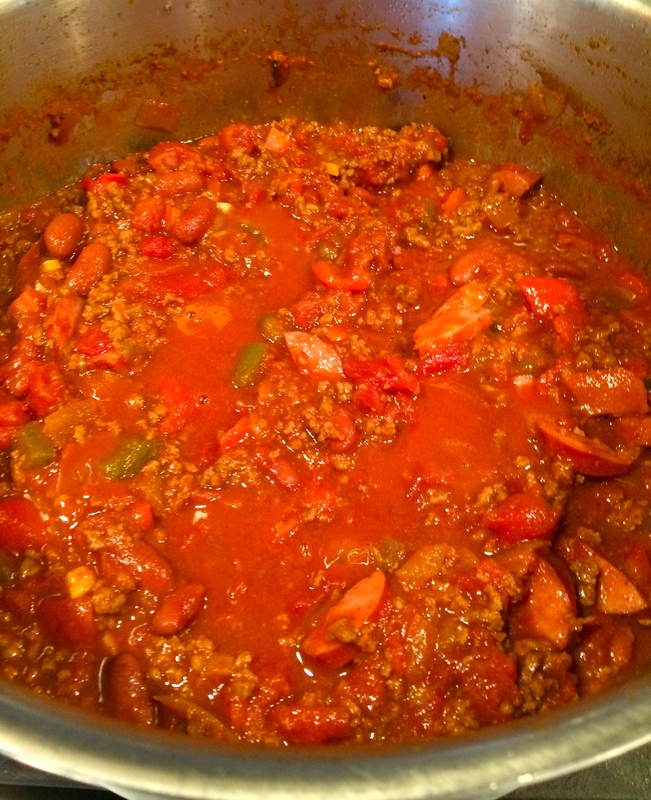 This entry was posted in recipe and tagged chili powder. Bookmark the permalink. Both recipes look delicious! I will definitely try them. We finally have FL weather today. But we are not complaining when we see your temps!